Lyndon LaRouche has provided the intellectual leadership for over four decades in the fight for a new international economic order. 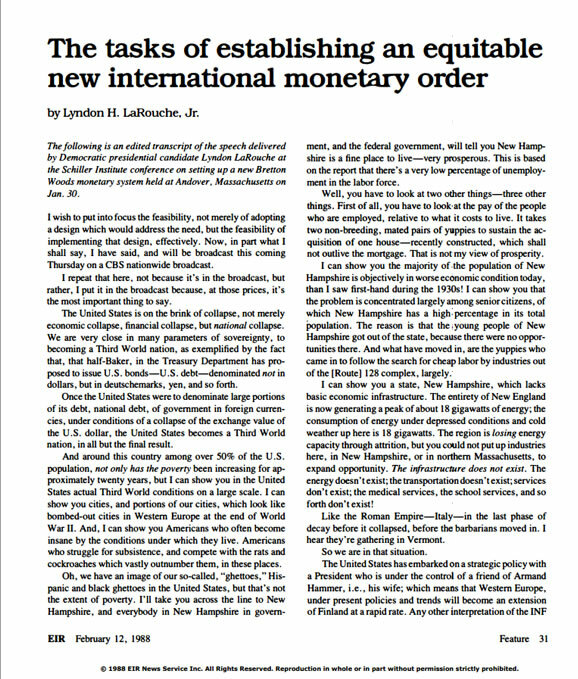 For over four decades, American physical economist Lyndon H. LaRouche, Jr. has provided the intellectual and political leadership in the fight for a new international economic order for the planet, for the purpose of ending the historic imperial control of monetarism and unleashing mankind's creative powers as a species. We have divided this lengthy history into four section, by decade, and we include links from the both text and the graphics to the original documents, for you to study. The profound impact of LaRouche's intellectual leadership is clearly reflected in the current actions being taken by the BRICS nations and others to create a new global financial architecture and strategic alliance among nations, with the recent establishment of the New Development Bank (NDB) and related developments. 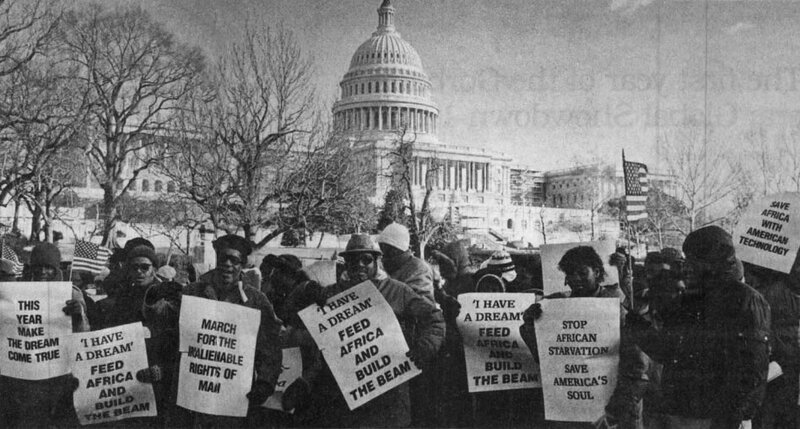 On January 15, 1985 the Schiller Institute organizes a 10,000 person 'March For The Inalienable Rights of Man' in Washington, D.C. for the creation of a new international economic order. On January 15, Helga Zepp-LaRouche addresses a 10,00 person 'March For The Inalienable Rights of Man' in Washington, D.C. organized by the Schiller Institute in honor of Martin Luther King, Jr.'s birthday, to call for the convening of an Indira Gandhi Memorial Summit between debtor and creditor nations "to implement a rapid program for massive debt renegotiation for a new, just world economic order." Helga LaRouche told the rally: "We have created a new movement, a movement for the Inalienable Rights of Man, for all people on our planet; and we will not stop fighting until a new, just world economic order has been created... I have a dream today that all men shall become brothers." Helga Zepp-LaRouche: 'We will not stop fighting until a New Just Economic Order is established. This is an historic day today. On the birthday of Dr. Martin Luther King, once again people from all over the United States, and from as far away as Africa, Asia, Ibero-America, and Western Europe are coming together to demonstrate in Washington. We are coming together here, because there is too much suffering going on in the world. Millions of people are staring in Africa, because of the murderous austerity policies of the International Monetary Fund and the banking system. We have to make people feel the suffering of these nations, or else it will come back here to the United States, where there are already 30 million people beneath the subsistence level. But, then, the enemies of the human race trampled on these rights, until President Lincoln revived the spirit of the American Revolution, in the famous Gettysburg Address, and ended the unworthy black slavery in the Emancipation Proclamation. And, when these rights were trampled on once more, Dr. Martin Luther King and the Civil Rights movement revived the spirit of the American Revolution once more. Today, the entire continent of Africa is condemned to death, and many nations are collapsing under the present monetary system. Therefore, we have created a new movement, the movement for the Inalienable Rights of Man, for all people on our planet; and we will not stop fighting until a new, just world economic order has been established. "We, therefore, the Representatives of the Peoples of the World, appealing to the Supreme Judge of the World for the rectitude of our intentions, do, in the Name, and by the Authority of all good people of all countries, solemnly publish and declare, that all the countries of the World are, and of Right ought to be, Free and independent States. "That all human beings on this planet have inalienable rights, which guarantee them life, freedom, material conditions worthy of man, and the right to develop fully all potentialities of their intellect and their souls. That, therefore, a change in the present monetary and economic order is necessary and urgent, to establish justice among the peoples of the world. "And for the support of this Declaration, with a firm reliance on the protection of Divine Providence, we mutually pledge to each other, our Lives, our Fortunes, and our Sacred Honor." There is no need for starvation and misery; let's use American technology to develop the developing nations. Let's put those 30 million poor Americans back to work in productive jobs, and produce the technology which Africa needs. We appeal to President Reagan, to change the economic policy, both the trends in developing nations and here at home, as well. We appeal to President Reagan to hold, within the first 1 00 days of his second administration, a summit meeting with Third World leaders to plan out for rapid implementation a program for massive debt renegotiation and for a new, just world economic order. This time, when civilization as a whole is at stake, we do not work only to overcome; this time, we must win. I have a dream today, that soon there will be a world without hunger, without poverty, and with conditions for all human beings on this planet worthy of the dignity of man. I have a dream today, the dream of Friedrich Schiller and Dr. Martin Luther King, that all men shall become brothers. At a conference in November attended by 800 people sponsored by the Schiller Institute in Rome, Italy, Helga Zepp LaRouche delivers the keynote titled "The New Just World Economic Order: Humanity's Only Chance for Survival," stating: "Only when we take the highest ideal of humanity as the point of departure for our efforts, will we be able to have a just world order based upon a community of national sovereign republics, progress among all peoples, and thus, peace." 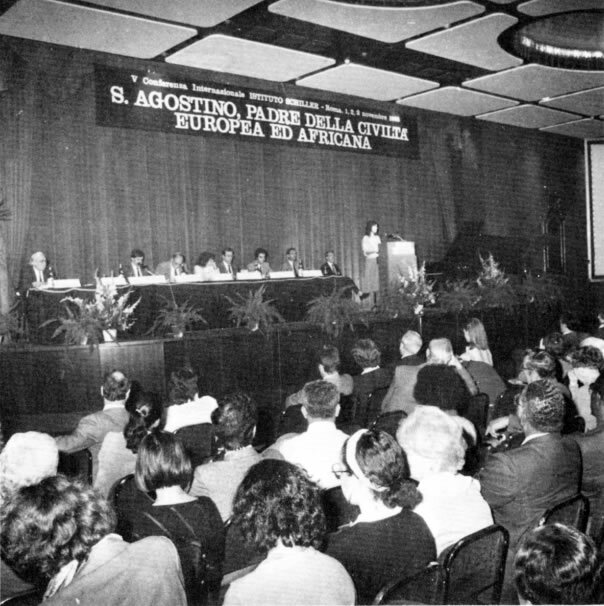 The conference is also addressed by numerous political, religious, and scientific leaders from Europe, Africa, South American, and the United States, who adopt a resolution addressed to Pope John Paul II, stating: "The Schiller Institute, gathered in Rome to celebrate the 1,600th anniversary of the conversion to Christianity of St. Augustine, the father of European and African civilization, sends greetings to His Holiness Pope John Paul II, requesting him to continue to exercise his religious leadership and moral authority in the present crisis of humanity to cast out the forces of usury and to favor the creation of a just New World Economic Order for all nations." The Schiller Institute published the book-length proceedings of its Rome conference for a new international economic order. Never before in his history has man suffered more agony; never before have human beings been subjected to such misery, far surpassing the powers of imagination, with millions of the world's citizens swept away by hunger and disease. And today for the first time, humanity is potentially confronted with its total extinction. Where can we find hope, that at this late and far-gone historical date, we can still swing the rudder around? Can we still find a rational solution, and indeed, might we still be able to establish a world order commensurate with the dignity of man? If we want to solve this immense problem, then it will only be from the standpoint of the very highest moral and philosophical principles, and never on the basis of the lowest common denominator, as has been the case until now at meetings and conferences of such institutions as the United Nations. Only when we take the highest ideal of humanity as the point of departure for our efforts, will we be able to have a just world order based upon a community of national sovereign republics, progress among all peoples, and thus, peace. It is precisely because the people and forces who personify evil in the world today, have succeeded in fomenting war between nations and civil war between competing political factions, setting tribes and ethnic groups against one another, and pitting men against their fellow men in terrorist attacks - precisely for this reason, it is imperative that we take the opposite, most exalted point of departure. Our very survival as a species will probably depend upon whether we do everything in our power to reorganize the world economy according to the economic principles of Operation Juárez, drawn up by my husband Lyndon LaRouche as concrete, practical instructions for reordering the international monetary system. The concrete alternative is in our hands: a new, just world economic order... We have drawn up all the concrete infrastructural development and industrialization programs, which will be necessary to put an end to hunger and epidemics in the developing countries. We must avoid committing the sin of omission now, so that we may avoid bringing about our own annihilation as well. 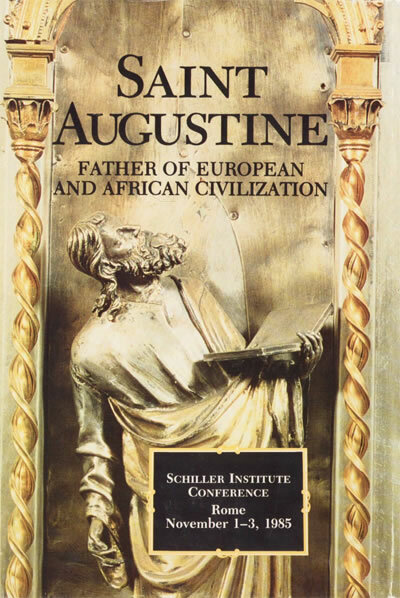 But above all, we need that tender love for the high ideal of humanity, which filled the hearts and minds of St. Augustine and Nicolaus of Cusa, and we must passionately commit ourselves, with our entire personal existence, to the progress of all peoples, and the to the inalienable rights of all individuals on this planet. Permit me to express my thanks to St. Augustine and Nicolaus of Cusa, for having bequeathed to us the concepts that we need today, in order that we may restore the dignity of man. A book-length Spanish-language report published by the Schiller Institute, serialized in English by Executive Intelligence Review. 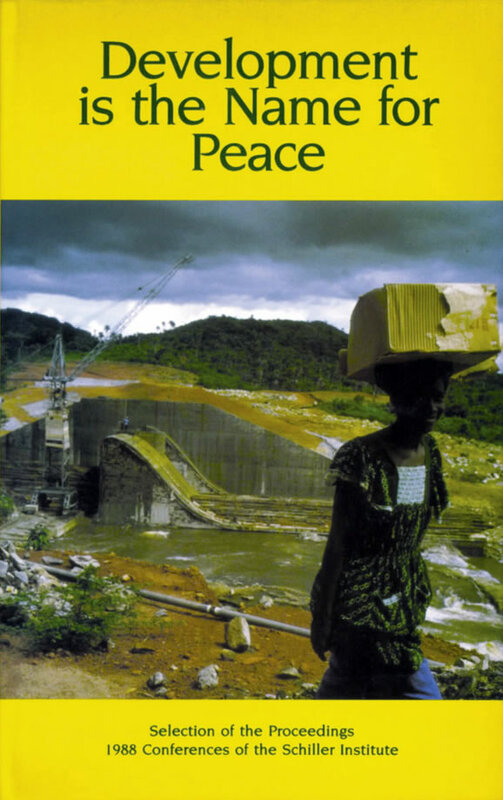 In 1986, the LaRouche movement publishes a 340-page book-length special report in Spanish, named La Integración lbero-Americana as an elaboration of LaRouche's Operation Juárez, specifying great projects for the development the continent, including the construction of a interoceanic sea-level 'Second Panama Canal' [PDF]. The introduction of the book states: "During the Malvinas War, in May 1982, U. S. economist Lyndon H. LaRouche, Jr. traveled to Mexico to meet with President Jose Lopez Portillo and other important political leaders. Some of them asked him to write out his proposal for dealing with the problem of the foreign debt. Three months later, the historic essay Operation Juárez was published, in which LaRouche takes up the old integrationist idea, and poses the necessity of immediately forming a Debtors' Club and an Ibero-American Common Market... This book intends as its primary purpose to contribute to the realization of that longed-for integration, demonstrating both the feasibility and the conceptual grounding for the Ibero-American Common Market. Its more detailed elaboration will be the task of that successful integrationist movement that we also seek to awaken and consolidate." 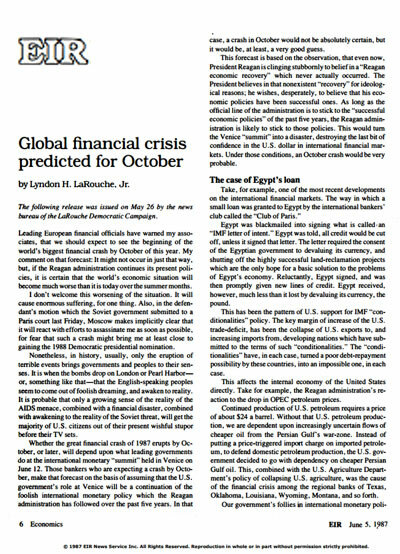 LaRouche forecasts a global financial crisis in October 1987 as a result of the failure to adopt his 'Operation Juárez' program. In May 1987, Lyndon LaRouche issues a press release titled "Global Financial Crisis Predicted For October" [PDF] in which he states that, under the conditions of "a continuation of the foolish international monetary policy" of the U.S. government," an October crash would be very probable." LaRouche identifies the IMF "conditionalities" regime under which debtor nations are forced to devalue their currency in order to obtain new lines of credit, "turning a poor debt-repayment possibility by these countries, into an impossible one, in each case." LaRouche states: "A 'zero-economic-growth mafia' inside the IMF and World Bank bureaucracies, acting with U.S. government support, has been collapsing the internal economies and world trade of both developing and Western industrialized nations, while piling up the financial obligations of both developing and industrialized nations. We have been increasing nations' obligations to pay debt, while destroying their means for paying that debt." The Crash of 1987 occurred in October, as LaRouche had forecast earlier that year. Precisely on schedule, on October 19 (now known as 'Black Monday'), stock markets across the planet crashed, with the Dow Jones losing almost a quarter of its value in a single day. 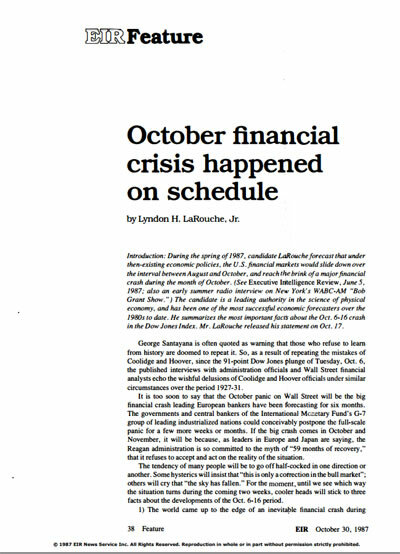 LaRouche issues a statement titled "October Financial Crisis Happened On Schedule" [PDF] in which he situates the crash in the context of the failure to enact his Operation Juárez program: "During the spring of 1982 I warned the world that a 'debt bomb' was about to explode in Central and South America. I forecast the explosion to begin during the period of August and September that year. At the request of leaders of some nations of Central and South America, in June of that year, I wrote a detailed report, titled Operation Juárez, explaining the nature of the crisis, and detailing the measures which both these nations and the U.S. government must take... President L6pez Portillo acted as my Operation Juárez report specified. The world was saved for another month. The governments of Argentina and Brazil promised to support Mexico's policy, but both later broke that promise. The Reagan administration rejected my Operation Juarez option, and moved to crush and loot Mexico, and to proceed to loot every nation of Central and South America... For this five years, we have paid a terrible price. What could have been the easily manageable 'debt bomb' crisis of 1982, has been pyramided into the biggest financial crisis in history." Whether the great financial crash of 1987 erupts by October, or later, will depend upon what leading governments do at the international monetary "summit" held in Venice on June 12. Those bankers who are expecting a crash by October, make that forecast on the basis of assuming that the U.S. government's role at Venice will be a continuation of the foolish international monetary policy which the Reagan administration has followed over the past five years. In that case, a crash in October would not be absolutely certain, but it would be, at least, a very good guess. This forecast is based on the observation, that even now, President Reagan is clinging stubbornly to belief in a "Reagan economic recovery" which never actually occurred. The President believes in that nonexistent "recovery" for ideological reasons; he wishes, desperately, to believe that his economic policies have been successful ones. As long as the official line of the administration is to stick to the "successful economic policies" of the past five years, the Reagan administration is likely to stick to those policies. This would tum the Venice "summit" into a disaster, destroying the last bit of confidence in the U.S. dollar in international financial markets. Under those conditions, an October crash would be very probable. Take, for example, one of the most recent developments on the international financial markets. The way in which a small loan was granted to Egypt by the international bankers' club called the "Club of Paris." Egypt was blackmailed into signing what is called an "IMF letter of intent." Egypt was told, all credit would be cut off, unless it signed that letter. The letter required the consent of the Egyptian government to devaluing its currency, and shutting off the highly successful land-reclamation projects which are the only hope for a basic solution to the problems of Egypt's economy. Reluctantly, Egypt signed, and was then promptly given new lines of credit. Egypt received, however, much less than it lost by devaluing its currency, the pound. This has been the pattern of U. S. support for IMF "conditionalities" policy. The key margin of increase of the U. S. trade-deficit, has been the collapse of U.S. exports to, and increasing imports from, developing nations which have submitted to the terms of such "conditionalities." The "conditionalities" have, in each case, turned a poor debt-repayment possibility by these countries, into an impossible one, in each case. This affects the internal economy of the United States directly... Our government's follies in international monetary policy usually come home to cause suffering inside the U.S.
A "zero-economic-growth mafia" inside the IMF and World Bank bureaucracies, acting with U.S. government support, has been collapsing the internal economies and world trade of both developing and Western industrialized nations, while piling up the financial obligations of both developing and industrialized nations. We have been increasing nations' obligations to pay debt, while destroying their means for paying that debt. the growth of consumer debt has reached approximately a saturation-level. depend upon mere "hot air," such as so-called "junk bonds" or similarly dubious bookkeeping accounts. When the system blows, more than half of the more than $13 trillion of hard-core debt obligations could blow, more than half of this inside the United States. The problem is approximately 20 years of bad monetary and economic policies by all Western industrialized nations... Technically, on any day that the U.S. government came to its senses, this crisis could be brought under control. The crash of 1987 is not inevitable. However, unless the goverments come to their senses, it is inevitable. To understand what has happened on Wall Street over the Oct. 6-16 period, the fundamental distinction between economy and financial markets must be recognized. "Economy" means "physical economy": the production and distribution of useful kinds of physical goods to productive enterprises and households. We measure this in terms of two factors, the amount of physical production per capita, and the amount of physical production per square mile of land in use. Since human productivity is affected by the level of cultural development of the workforce and managements, as well as the physical well-being of the households from which the workforce is recruited, we include categories such as direct production management, science, and engineering, education, and health care and public health services as part of the direct labor cost of everything produced. Every other form of employment and income-related activity is part of the "overhead burden" of the physical economy. Over the past 20 years, especially the past 15 years, the physical economy of the United States has been in decline, but the Gross National Product has been rising during most of these years. The difference is that real growth is measured in terms of physical output and productivity rates in production of physical output; Gross National Product is measured in terms of financial data. Without understanding the fundamental difference between the two kinds of measurement, it is impossible to understand why the world's biggest financial crash is coming, and what happened to the stock market this month. A purely financial market is measured in terms of what is commonly termed a "price-earnings ratio": For example, the ratio of the price of a stock to the combined dividends and retained earnings of a corporation. Under normal conditions, "earnings" have a significant connection to real production; the net earnings of farms, industries, and utilities are a large factor in determining the market price of common stocks, and so on. Under normal conditions, a price-earnings ratio of between 10 to 1 and 20 to 1 would be competitive. Compare such a normal range of price-earnings ratio to the price-earnings ratio on the American financial markets today. By normal standards of the 1950s or early 1960s, the market is floating in the vicinity of 1,000 to 1. The amount of combined dividends and retained earnings from production available to holders of financial paper, is floating near 1,000 to 1. This has happened because the price-earnings ratio is being determined by financial capital gains on actual or expected resale price of financial paper. Financial analysts describe the result by saying that "financial markets are highly leveraged." Financial paper is sold at prices based on expected financial capital gains, at a time when the ratio of expected capital gains of this sort is many times the amount of real earnings from production. Worse, most of the holdings of financial paper are based on credit borrowed at very high prices compared to levels of interest rates during the 1950s and 196Os. This includes so-called "creative" forms of financial assets, including "junk bonds." Raising the Wall Street stock market to above 2,700 points on the Dow Jones Index, has depended upon a massive flow of inflationary credit of this sort into markets, plus heavy inflow of cash dollar assets from Saudi Arabia, Japan, and Western Europe. The higher the price of stocks zoomed, the more inflationary credit, plus Saudi, Japanese, and European cash was needed to cause the market to continue rising. If this did not occur, if the stock market ever slowed its rise in prices significantly, the source of new capital gains would be dried out. Without new capital gains of that sort, the market would spin into a chain-reaction collapse. So, the growth in financial markets-in Europe and Tokyo, and well as the United States-has been a classical financial "bubble," like John Law's famous "Mississippi bubble" of the early 17oos, and the South Sea Bubble which popped in Britain during the same period. It is a "bubble" like the "Pyramid Club" fad which victimized many duped U.S. citizens during 1949, or the famous "Ponzi" scheme earlier. It is a "chain-letter" scam, which collapses once the market runs out of an expanding number of suckers to pay into the scam. Sooner or later, the Wall Street financial bubble, and the giant U. S. real estate bubble had to pop, and carry the already depressed U.S. economy into a deep depression with it. By spring of this year, it was clear that the bubble had been stretched almost to the breaking point. The bubble was ready to burst at the end of 1981. My associates and I warned this was coming at the beginning of 1982. 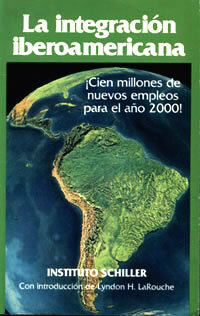 During the spring of 1982 I warned the world that a "debt bomb" was about to explode in Central and South America. I forecast the explosion to begin during the period of August and September that year. At the request of leaders of some nations of Central and South America, in June of that year, I wrote a detailed report, titled Operation Juárez, explaining the nature of the crisis, and detailing the measures which both these nations and the U.S. government must take. Copies of this report were delivered to both the Reagan administration and governments of Central and South America during the first week of August 1982. About two weeks after my report had been delivered, the debt bubble popped in Mexico. During a period of about two hours, the world financial system wobbled on the brink of a "new 1931 collapse." President Reagan telephoned Mexico's President Jose López Portillo. This telephone call saved the world's financial markets for a moment, but the crisis continued. President L6pez Portillo acted as my Operation Juárez report specified. The world was saved for another month. The governments of Argentina and Brazil promised to support Mexico's policy, but both later broke that promise. The Reagan administration rejected my Operation Juarez option, and moved to crush and loot Mexico, and to proceed to loot every nation of Central and South America.Wall Street had demanded this; the Reagan administration capitulated to Wall Street. By various tricks, since October 1982, the Reagan administration and the IMF have bought five years of continued existence of the sick old financial system. The only alternative, is to scrap existing monetary policy, and to re-institute the strict regulations needed to stabilize currencies, government bonds, and keep open the doors of banking institutions. That would work, but it would mean scrapping every economic and monetary policy of both the Carter and Reagan administrations. In 1787-89, the United States was at the edge of national bankruptcy. Benjamin Franklin, George Washington, Alexander Hamilton, and others recognized the nature of the problem, and organized a constitutional convention for the purpose of creating the kind of strong federal government needed to reorganize the economy. The combination of the strong presidential system, under the new Constitution, and Washington's and Hamilton's organization of what was called "the American System of political economy" rapidly transformed the economic situation. In that sort of economy, described in Hamilton's reports to Congress on the subjects of public credit, a national bank, and manufactures, was established a different sort of economy than the chaotically deregulated mess we have today. In such a national economy, accurate economic forecasting is much easier to accomplish than under the present sort of chaotic, deregulated, and bankrupted "free trade" system. Under the American System of Washington and Hamilton, financial flows are tied very closely to both tangible investment and production rates. In that system, earnings on production and financial earnings of enterprises are very nearly in correspondence. So, in that case, an economic forecast is also a very good estimate of financial trends, as it is not under the monetary order of the past 20 years. 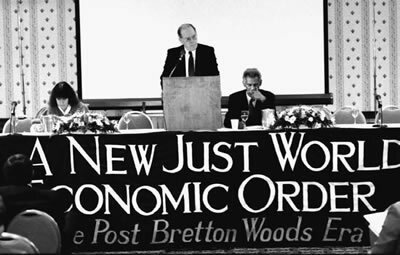 1988: LaRouche in Bretton Woods: "A New International Economic Order"
Lyndon LaRouche addresses Schiller Institute conference 'A New Just World Economic Order' held in Bretton Woods, New Hampshire in January 1988. 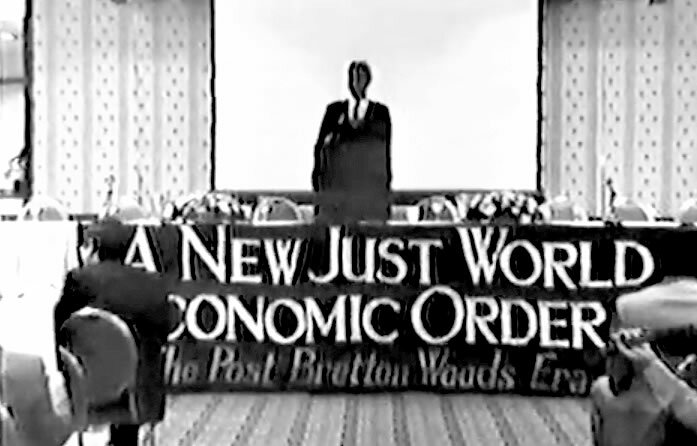 The Schiller Institute sponsors a conference in Bretton Woods, New Hampshire titled "A New Just World Economic Order: Development Is The Name For Peace" on January 30-31, 1988. In attendance is Frederick Wills, former Foreign Minister of Guyana, who delivers a speech titled "The History of the Fight for the New World Economic Order" [PDF] relating how he first became acquainted with Lyndon LaRouche and his idea for an International Development Bank. Wills declares: "It is time to return to the fundamental appreciation that money and monetary systems are the servants of humanity." Helga LaRouche also spoke on "The Dignity of Man in a New World Economic Order," and Lyndon LaRouche delivered the keynote, titled "The Tasks of Establishing an Equitable New International Monetary Order" [PDF] in which he describes the history of his Operation Juárez proposal, and elaborates how the President of the United States can act to create a new international monetary system to replace the post-1971 Bretton Woods system: "As President, I would have most of the so-called "Third World" leaders meet, and settle immediately the question of restructuring and reorganization of debt. Once the United States government has entered into such an agreement with a group of developing nations on restructuring and reorganizing of their external debt, and expansion of their import capacity, and conditions of new volumes of loans for economic development, the rest of the world just has to go along with it. And, thus we would have, in effect, the basis for a new monetary system." Frederick Wills, former Guyanese foreign minister, addresses Schiller Institute conference 'A New Just World Economic Order: Development Is The Name For Peace' held in Bretton Woods, New Hampshire. Four decades ago, when I was a student in Europe, we would meet, filled with the radical missionary zeal of youth, wanting to see the old world go spinning down, as the poet said, spinning down the ringing grooves of change, to a new economic order. We believed in those days, and we still do, that life is the fundamental essentiality of natural processes. Life has to come into existence, life has to survive, life has to grow, life has to develop. We were sure then, and I am sure now, that the assumptions of present existence are unacceptable. One only has to regard the madness that is going on outside. I must pause and ask you to bear with me while I remember those who have fallen in this fight for a just, new economic order. There are many of them, but in particular, I want to remember Indira Gandhi, Gamal Abdel Nasser, and Marshal Tito, whom I met, as pillars of what we call the Non-Aligned Movement. They're dead, and, as the poet said, "they shall grow not old, as we who are left grow old. Age shall not weary them, nor the years condemn, as the going down of the sun, and in the morning, we shall remember them." And in remembering them, I shall ask you to rededicate and recommit yourselves to the purposes of this conference, because it is clear what is happening. It is clear what the solution should be. The only problem is the will to implement it. That mankind has to intervene is obvious. The quality, nature, promptness, and efficacy of that intervention is what we are met here to consider. There are three outstanding events I want you to recall, that happened after the Second World War. Generalized technological advance took the form of the nuclear age. That was very important. Secondly, there was a proliferation of new states in the world. I give you one example. In Africa, there were three independent states in 1939. In 1987, there are now 50. There's an immense balkanization of Africa, and, by and large, they created not nation-states, but what I called state-nations. They deemed you to be a state, and therefore, a nation. The third thing, and that's why we are here, and these are all connected, is the establishment of the Bretton Woods system, in a little place in New Hampshire, where they met in 1944, and concluded treaties by 1946. I wanted to tell you this, that being a living part of the decolonization process, one of the terms of the British, and French, and Dutch, and Belgian withdrawal from colonialism was, that you must join the Bretton Woods system. That was one of the terms. You did not get independence unless you agreed to do that. It is one of the silent, unspoken premises of alleged independence. We were filled with hopes. We were warned. I warned, that you have to be careful and let decolonization not be the transfer of a kind of pseudo-sovereignty from a metropolis in Europe to some institution. Because - I think the French have a lovely expression, plus ça change, plus c'est la même chose - independence could be one of the greatest examples of nominalist hypocrisy you could ever meet. But, there were those, then and now, who think that you are a doomsayer. Believe you me, ladies and gentlemen, the "I told you so" guy is never liked. One of the reasons why my good friend Lyndon LaRouche is not appreciated in America, is because every time a new tragedy happens, he's the "I told you so guy." We had ideas. We wanted a new international order. We wanted to diversify agriculture, put in infrastructure: health housing, education; industrialize, bring the Third World - which is very important, the developing nations, 80 percent of mankind lives there, you know - bring them out of the 14th and into the 20th century. Grandiose ideas. Independence was not an end in itself, but only a means to an end. The end was development. Nations and peoples have to come into existence, have to survive, have to grow and have to develop. Those were our aims. My friends, I want to suggest to you that the test of any monetary system is its capacity to enshrine institutions of credit. That's the test. It's not whether the U. S. dollar is doing well as against the yen, or what they're doing to the German mark. The important thing is, what institutions of credit do you enshrine? What access do you give to those institutions? How do you distribute credit? That is the key thing about any monetary system. It is not whether only the dollar is monetized in gold. It has nothing to do with that. The original sin of the Bretton Woods system, I found, the original sin, was that the vast majority of mankind, in the developing nations, 80 percent of mankind, were told that they could have access to international credit only at the price of the surrender of their sovereignty in determination of economic policy. But we were sovereign, we thought. Sovereignty meant sovereignty. And then I had a phone call in 1971 from a secretary in the ministry of foreign trade, which hat I was asked to wear, by a heartless prime minister. The phone call said, Richard Nixon, Richard Milhouse Nixon, to be quite precise, has taken the dollar off the gold standard and "let the dollar float." It used to be $35 an ounce. It shot up to $800. What that meant, of course, was massive devaluation, because we were at the time two Guyana dollars to one U.S. dollar. That was the rate of exchange. By no act of our own, by a mere imperial order, by executive order of Nixon going on television, the money of Guyana and all the Third World was devalued. That's the meaning of sovereignty. And there were further devaluations as you went along. By the time he was finished, and the IMF was finished, as I stand here now, it was two Guyana dollars to one U.S. dollar. It is now, officially, 20 Guyana dollars to one U.S. dollar. And unofficially, in the underground economy of dope, prostitution, gambling, and what have you, it's 30 Guyana dollars to one U. S. dollar. The idea of the Bretton Woods system after the Russians had decoupled and gone their way with their own machinations, was that the U. S. dollar would be the only money quoted in gold, and we would all be quoted in U.S. dollars; and institutions would be set up, IBRD [the World Bank], IMF. The important thing is, that the IMF handled credit systems, and there was bound to be a balance of payments disequilibrium, between export receipts and what you imported, and your total need to fill the gap. You needed credit, and the IMF controlled that. A kind of corrective colonialism - more calloused than the colonialism that preceded it. You all went to the IMF, and you were subjected to conditionalities. "Devalue; cut government spending" - you've heard this before - "fiscal discipline; untrammeled free market." In response to which I once told an American ambassador, that I must check with my ancestor, because he seemed to have suffered terribly from an untrammeled free market system. He was a slave. Don't ask for all the sophisticated technology that Lyndon LaRouche has been speaking to us about. Take the California maxim. Do your own thing. Burn peat. Burn mud and wood. Import cosmetics. Don't import medicines. Things of that kind you were told. So I reminded them again, that slavery itself was appropriate technology. And we had enough of that. It fell on deaf ears. I was marked on by my very good friends, the British, as a person who's never satisfied. Well, I'm never satisfied, so long as a single human being has to live in degradation. So long as we go spiraling down the corridors of ruin, I shall not be satisfied. And that's why I am here. It was a consequence of that, that 1976 became a crucial year for me. The year started off with Marcos holding a conference in Manila. We all went down there, and gave speeches, 'and I was asked to see the American government. So, being a difficult guy, I went ' round the world. I left one way through London to Manila, and I then came to California. I remember that well, because snow fell in San Francisco, and it hadn't done so in eight years. So obviously something was afoot. Then I came to New York. And then I went and met a guy named Henry Kissinger. You've heard that name, I suppose. We seem to have in the modern era in America a vast number of educated but unintelligent 'men. It's a phenomenon. You can't deny that in a formal way, they have been educated. But when you examine their mental processes, their noetic processes, it's amazing. We were discussing why Guyana doesn't vote with America in the U. N. He wanted us to vote a certain way; we did not. I said sovereignty is sovereignty, and he cut off aid to Guyana and Tanzania and some other place. Kissinger greets me and starts to discuss architecture, if you please. And then he starts to discuss music. I follow him. And then he starts to speak about the Periclean Age in Greece, and I follow him, but I thought, this guy is controlling the agenda. So, I must now wrest the agenda from him. Because he's trying to impose his will on me. Understand in that kind of diplomacy, he who controls the agenda, controls the interpretation of current reality. So I said, what do you think about development in Zambesi culture? I knew he knew nothing about that. And the minute I said that, he got back to the question. He got back to why I was there. Because he wasn't going to let me set the agenda. But you have to know how to deal with lunatics of this kind. So I went to the U. N. and I asked for an International Resource Bank... In my hotel room, there were quite a few supporters, and a gentlemen, who had an amazing capacity for cutting out the crap, and dealing with reality. And he, whom I'd never heard before, visited me and was speaking - it was Lyndon LaRouche. I listened, and I wanted to know, how could the Americans indulge the luxury of not having a man like that in their government. Because I tell you this, some of these guys couldn't get elected in the Third World. I want to say to you today, this. If this planet is destroyed, this planet Earth, it will be because of mismanagement of economic science and that is why we are here. I want to say to you, that bad economic policies have led to highly suspect accounting feats, damage limitation. That's what they're doing. But we have now transcended the possibilities of arithmetical illusion. You can juggle books, you can work your symbolisms, but with starvation, disease, and hunger rampant, those tricks no longer work. The time for palliatives, for exhortatory, verbal panaceas, is over. This is the time for fresh procedures. And that's why we're here. This is a time for surgery, and that's why we are here. Life on this planet is too valuable to be left to the idiosyncrasies and foibles, embellished and nominalist idiocies of the contemporary economists. They have failed. They and their policies must go. It is time to return to the fundamental appreciation that money and monetary systems are the servants of humanity. They are not ends in themselves. It is time to appreciate that we have reached not only a crisis in interpretation of reality, as I said before, but that we need a qualitative change in the financial systems of this world. We need new credit mechanisms. That is why we are here. We need new mechanisms for the generation of human survival. New mechanisms for the generation of human growth. New mechanisms for the generation of human development. We need rational avenues of access, by everybody to all the new credit mechanisms we might create. The need for intervention is clear. We cannot remain passive in the presence of impending catastrophe. Our intervention, as exemplified by this conference, must be based on reason. The choice of action by reason, over action by feelings and appetites, is not a mere choice of options, a word they like in the halls of leadership these days. When reason is ignored, the forces of nature serve up terrible reminders. Just re-read the history of the 14th century. We must have confidence in new technologies, that illuminate man's horizon at the moment, and all development, and the pathways to development. Starvation, famine, disease, recession, depression, are not culturally ordained. They are not the permanent pillars of cultural relativism. Stop going down to the Third World, where 80 percent of mankind lives, and tell them, that is your way of doing things. Stop that! Stop carrying Racine and Moliere. Carry Pasteur and Madame Curie. We must not and cannot allow the growth to degenerate into a pandemic wilderness. I say we cannot furl the flags of human progress. That is what this conference is about. Once again, we are met to establish a new monetary system. We are not here to repeat the mistakes of the old. Above all, we're not here to deify, hallow, the assumptions of the old system. We are here because we know that mankind need not remain passive in the face of impending doom. But if we don't do it, there's nobody left to do it. We are the thin, red line, standing on the lip of progress. If we lose, it's not personal battles and personal tragedies. It's a decision about whether mankind on this planet has a future. I therefore ask you, in the name of those present, in the name of those departed, who've been in this fight for a new economic order and new monetary systems and new mechanisms of credit, I ask you not to let us fail again. I think we have the intelligence in this room, the leadership and the directionality, and the resolve to triumph over the present. Speech delivered by Lyndon LaRouche at 1988 Schiller Institute conference held in Bretton Woods, New Hampshire. The present monetary system essentially came to an end by about 1982. I was there, I was consulting with the Reagan administration, in pushing what became known, a year later, or so, as the SDI. In that connection, I warned the Reagan administration, through the National Security Council, and other institutions, that as a result of decisions made at the end of 1981-international monetary decisions-that the external debt of the nations of South and Central America was about to blow out, with Mexico at the head of the list. I warned of that over the first six months, and after meeting with López Portillo, in a discussion of the situation. I had reviewed to him what the problems were: that we could expect the Mexican debt situation to blow out by September of that year, 1982, and that the forces in the United States, were prepared to take Mexico apart piece-by-piece a process which has been going on ever since, and which is not completed. I indicated to him that we would have to act very soon, not in the case of Mexico, but in other parts of the continent, to reverse this process if we were going to save these countries, because all of them were doomed similarly, on the basis of the policies floating around the Reagan administration at that time. So, in that context, friends of ours, including the SELA [Latin American Economic System] group, approached me, and said I should put my ideas into a book-length manual-stating to all the people, particularly in Hispanic America, and all of those who agreed with us-give them a working manual so that they could work together to common effect around these sorts of things in this crisis. There was a very significant movement in that direction, at that time. At the same time, when I completed the thing on the first of August, I presented the manual to the Reagan administration. About two weeks after I submitted the manual, of course, the Mexico debt crisis fell, and the entire world monetary system nearly went over the cliff in a two-hour period on the day of the Mexican announcement. The President of the United States, Reagan, called President López Portillo on the phone and offered to use U.S. credit for the United States to help Mexico carry over this particular crisis-that delayed the crisis. The President of Mexico López Portillo, with, at that point, the commitment of the President of Brazil and the government of Argentina, acted to implement a set of proposals identical to those which I had outlined in this report, which I entitled, Operation Juárez. There was a fight inside the Reagan administration, with people inside the National Security Council, CIA, and elsewhere, taking my side on the issue, and Henry Kissinger's friends taking the opposite side. Well, needless to say, we lost the fight. The President of Brazil chickened out, betrayed the President of Mexico. The Argentine junta demonstrated what kind of a military leadership it represented by chickening out, betraying the President of Mexico. President Lopez Portillo was left hanging out to dry, and his country was chopped to pieces, piece-by-piece, or by bleeding. Over the period since, it is now at the point of virtual destruction. of treaty agreements of governments. If governments abrogate those treaty agreements, or alter them, it simply ceases to exist. The IMF can sit there, it can vibrate, it can oscillate, but it just sits there. The same with the World Bank. The monetary system has to be based on the authority of sovereign governments. It is effectively a treaty organization among sovereign governments, and has no legitimate authority, except as a treaty organization of sovereign governments as partners. Therefore, what we simply do, is we take the old monetary system, put it to one side. And, thus we would have, in effect, the basis for a new monetary system, simply by these kinds of agreements. What would make it a monetary system, would be the agreement of the other countries, the Western European countries, and others, to agree to give these countries lines of credit for their infrastructure, agricultural, industrial development projects, including such things as health programs and educational systems under infrastructure. Supply them what they need. Give them the means that they require to employ vast armies of unemployed labor, or misemployed labor. But, in general, in my opinion, from looking at many development projects in developing sectors, most developing countries could undertake most large-scale development projects" using 80% domestic resources; what they require from foreign countries is essentially certain crucial included elements of the project which amount to about anywhere from 5% to 20% of the total package. The trick is to enable countries to survive on their own resources, to give them the ability to mobilize their labor. To give them the ability to lay the basis for their own development, as sovereign states: And we can do that. LaRouche forecasts fall of Berlin Wall at press conference in West Berlin in 1988. 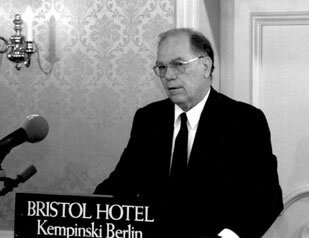 On October 12, 1988, Lyndon LaRouche delivers a press conference in West Berlin "on the subject of prospects for the reunification of Germany," asserting that "the world has now entered into what most agree is the end of an era. The state of the world as we have known it during the postwar period is ended." LaRouche stated: "The economy of the Soviet bloc is a terrible, and worsening failure... The Soviet bloc economy as a whole has reached the critical point, that, in its present form, it will continue to slide downhill from here on." Therefore, LaRouche said, "the time has come for early steps toward the re-unification of Germany, with the obvious prospect that Berlin might resume its role as the capital." LaRouche elaborated a program for the cooperative development of Eastern Europe as an engine for creating a new economic system: "Let us say that the United States and Western Europe will cooperate to accomplish the successful rebuilding of the economy of Poland. There will be no interference in the political system of government, but only a kind of Marshall Plan aid to rebuild Poland's industry and agriculture. If Germany agrees to this, let a process aimed at the reunification of the economies of Germany begin, and let this be the punctum saliens for Western cooperation in assisting the rebuilding of the economy of Poland." 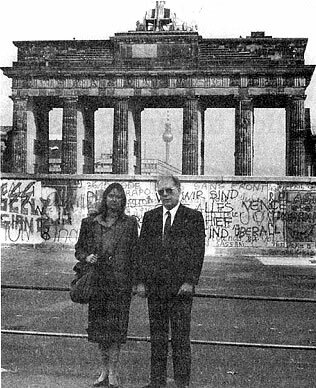 Lyndon and Helga LaRouche stand in front of Berlin Wall in 1988, one year before its fall. For these reasons, during the past fifteen years I have become a specialist in my country's foreign affairs. As a result of this work, I have gained increasing, significant influence among some circles around my own government on the interrelated subjects of U.S. foreign policy and strategy. My role during 1982 and 1983 in working with the U.S. National Security Council to shape the adoption of the policy known as the Strategic Defense Initiative (SDI), is an example of this. Although the details are confidential, I can report to you that my views on the current strategic situation are more influential in the United States today than at any time during the past. Under the proper conditions, many today will agree, that the time has come for early steps toward the re-unification of Germany, with the obvious prospect that Berlin might resume its role as the capital. For the United States, for Germans, and for Europe generally, the question is, will this be brought about by assimilating the Federal Republic of Germany and West Berlin into the East bloc's economic sphere of influence, or can it be arranged differently? In other words, is a united Germany to become part of a Europe from the Atlantic to the Urals, as President de Gaulle proposed, or, as Mr. Gorbachov desires, a Europe from the Urals to the Atlantic? The economy of the Soviet bloc is a terrible, and worsening failure. In Western European culture, we have demonstrated that the successes of nations of big industries depend upon the technologically progressive independent farmer, and what you call in Germany the Mittelstand- Germany's small and medium-sized entrepreneurs. Soviet culture in its present form is not capable of applying this lesson. Despite all attempts at structural reforms, and despite any amount of credits supplied from the West, the Soviet bloc economy as a whole has reached the critical point, that, in its present form, it will continue to slide downhill from here on, even if the present worldwide food crisis had not erupted. At the same time that we discourage Moscow from dangerous military and similar adventures, we must heed the lesson taught us by a great military scientist nearly four centuries ago, Niccolo Macchiavelli: we must also provide an adversary with a safe route of escape. We must rebuild our economies to the level at which we can provide the nations of the Soviet bloc an escape from the terrible effects of their economic suffering. Recently, in response to the food crisis, I sponsored the formation of an international association, called Food For Peace. This association has just recently held its founding conference in Chicago September 3-4, 1988, and since then has been growing rapidly inside the United States and in other nations represented by delegates attending that conference. During 1988, the world will have produced between 1.6 and 1.7 billion tons of grains, already a disastrous shortage. To ensure conditions of political, and strategic stability during 1989 and 1990, we shall require approximately 2.4 to 2.5 billion tons of grain each year. At those levels, we would be able to meet minimal Soviet needs; without something approaching those levels, we could not. All of us who are members of that stratum called "world-class politicians," know that the world has now entered into what most agree is "the end of an era." The state of the world as we have known it during the postwar period is ended. The only question is, whether the new era will be better or worse than the era we are now departing? Heute, ich bin auch ein Berliner. 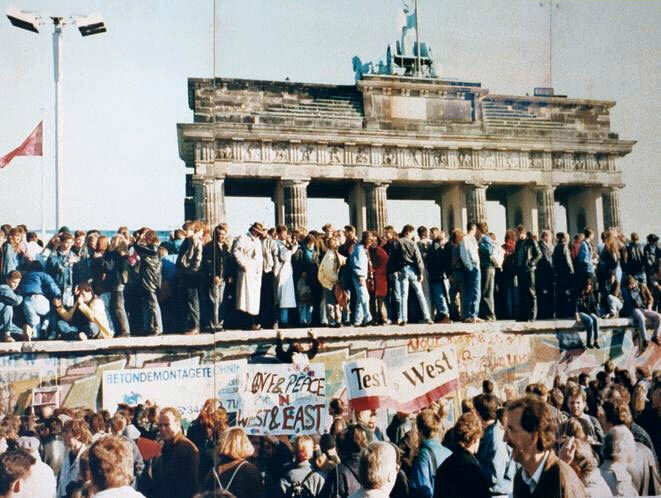 The fall of the Berlin Wall on November 9, 1989. Within one year of LaRouche's forecast of the coming reunification of Germany, mass demonstrations in Leipzig and other cities in East Germany lead to the lifting of emigration restrictions for people wishing to leave the G.D.R. on November 9, 1989. Numerous border crossings are opened, including the Berlin Wall, thus marking the end of the 'Iron Curtain' division between East and West. The East German state is officially dissolved on October 2, with an official celebration featuring Ludwig van Beethoven's Ninth Symphony in the Schauspielhaus in the former east sector of Berlin. Lyndon LaRouche's proposed 'Productive Triangle' development plan for Europe. Lyndon LaRouche immediately commissions a policy study to elaborate his proposals from the previous year to use the modernization of Eastern Europe as the "locomotive" for the economic development of Eurasia. 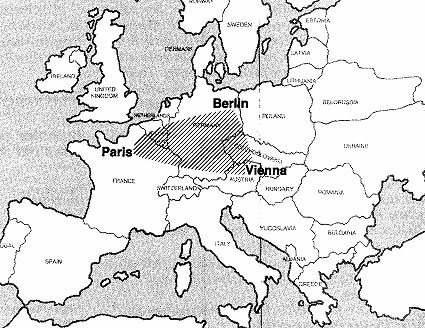 The concept takes the form of the "Productive Triangle" linking together Paris, Berlin, and Vienna through high-speed rail, thus creating an integrated high-density 320,000 square-kilometer industrial development zone, spiraling out into eastern Europe via transport, energy, and communication development corridors. LaRouche elaborates the proposal in a policy paper composed the following year, "The Economic Development of Eastern Europe" [PDF] in which he counterposes his 'Productive Triangle' program for development to the shock therapy plan, which he asserts is merely a different form of the same model of 'primitive accumulation' that brought down the Soviet state. These papers at the time centered around a project which came to be known as the Strategic Defense Initiative, so named by the Reagan administration. This project was initiated by myself beginning in 1 981 in response to an approach by a Soviet representative then based at the United Nations. As a result of this, a back-channel discussion was set up, coordinated with the national security institutions and selected high-level layers of the national security apparatus of the United States, and the Soviet government, for the purpose of exploring potential Soviet responses to my proposals. The special current relevance of these materials, which constitute in effect a kind of white paper on the background of the SDI, is that we now face a calamitous situation, in which, with the changes in Eastern Europe and the crises erupting in both Eastern Europe and the Anglo-American sector most emphatically, a new approach to the Eastern European problems, based on many of the same principles treated under the earlier SDI rubric, is now required. The new approach centers not upon the United States as the point of origin, but rather upon Western continental Europe as the point of origin, in part because Western continental Europe, together with Japan, is the only section of the world economy viable, at least to the degree of being capable, of launching the kind of global economic recovery initiative required at this time. The current approach is focused upon what is called the "Productive Triangle." The Productive Triangle, documented in other locations, is identified here as a small area, approximately about the geographical size of Japan, with a population of slightly over 100 million persons presently, covering an area pivoted upon three principal cities in Western Europe-Paris, Vienna, and Berlin-and including the greatest concentration of density of productive power of any comparable area on this planet. It is seen that the economic organization of Europe, if it is to have a rational form at the present time, must be viewed as a development centered within this Productive Triangle, connected to the other principal centers of Europe by what we have chosen to call "spiral arms." The spiral arms are characterized largely by more or less broad channels of combined rails, power, and production, linking such cities as Berlin to Soviet locations such as Leningrad or Moscow, or to Kiev in Ukraine, and similarly linking other points of the triangle to other parts of Europe. The integrated economic development of Europe, by aid of the spiral arms into this triangle, is the approach which is seen as uniquely applicable to assisting in solving the present deadly crisis within Eastern Europe generally and the Soviet Union in particular. There are two principal, crushing problems with economies of the Soviet Union and other former CMEA states. One is fairly described and is understood within the Soviet lexicon as "socialist primitive accumulation," using that term as it was employed during the 1920s and early 1930s by Soviet economist Yevgeni Preobrazhensky, a term which Preobrazhensky credited rightly to Rosa Luxemburg. To put the matter in perspective, primitive accumulation does not have to be limited to the so-called cases of states with socialist constitutions, although it is savage enough there. We have primitive accumulation occurring under the rubric of Adam Smith policies characteristic of the Anglo-American system, the English-speaking system, especially today. It also occurs in such other, derived, Adam Smith forms as the old colonial, neocolonial systems, including the present International Monetary Fund (IMF) conditionalities and General Agreement on Tariffs and Trade (GATT) arrangements. Primitive accumulation signifies, essentially, a modern name for, or is another term to describe, usury or the effects of usury. Usury is expressed for us, of course, simply as financial usury, but it takes three notable forms. such as food cartels. Third, we have primitive accumulation in the form of looting, largely through financial and "free market" practices, of industry, of agriculture, and of the usage of real estate for such purposes as industry, agriculture, home rental, and what-not. alternative might be or how to get to any alternative. There do appear to be some who think they know what the alternative is, but in our view the proposed alternatives are worse than the disease. Obviously, the collapse of the Bolshevik economic system in the form that it existed in the 1980s, strikes Eastern Europe and the Soviet Union with such dismay that there is a tendency to look to the West, on the presumption that Western propaganda is true and !the Voice of America is reliable, to the effect that all Western economies are successful and follow the same so-called "free market" principles. The parallel between my proposals for development of the sm and the development of the Productive Triangle, is that both require that a state function using three principles to foster rapid growth in a manner consistent with the earliest conceptions of U. S. Treasury Secretary Alexander Hamilton and Friedrich List, and Leibniz before them. The American System is the development of basic economic infrastructure by the state, and the understanding that it is the state's responsibility to generate the credit, the direction, and the maintenance of these projects. This is done either directly through state economic action, with the state as employer and economic entity managing these functions, or through the state creation of a relatively global system of regulation, within the boundaries of the state and in cooperation with other states. The latter allows private interests to build, operate, and maintain some infrastructure monopoly, but under state control or regulation of that monopoly, under conditions which must be fulfilled in order to continue to enjoy that monopoly. That is the American System, as implicit in the first section of Article I of the U.S. Constitution. That is one method to foster growth. The other is of course the fostering of technological progress, which means also a fostering of entrepreneurial activities in two respects. There must be a state-sponsored, i.e., national consensus, task-oriented project orientation, which has two aspects. One is a fostering of very high technology for the small entrepreneurships, exemplified by the machine tool shops, high-technology repair shops, and so forth, and the other for private agriculture and manufacturing. The project which comes to the core of Leibniz and of the idea which is presented here, is the SDI, as it was conceived and presented to the Soviets as well as to the United States. It was a crash program employing new physical principles developed as an aspect of strategic ballistic missile and related military defense in such a manner as to spin off into the economy new machine tool types consistent with the same technology-the idea of the laser-related machine tools, the ultra-high-temperature, high energy-flux-density plasma processes, and so forth. Those things should become the commonplace of production through spinning off the military machine tool sector directly into the civilian machine tool sector, which thus is transformed. This technology applied to the smaller machine tool field, is spun off into agriculture and industry at the same time, and thus you get a highly rapid rate of per capita growth of productivity and standard of living at the same time. We should also emphasize that large-scale state, or state-sponsored, or state credit-sponsor, or employment, in terms of the development of infrastructure (including education and medical health care delivery), is also, a proper stimulus to the economy. It should also be emphasized that there should be a policy of close to zero unemployment, of less than 1-2% actual unemployment of the candidates or the labor force in the economy, and this is to be accomplished by expanding infrastructural projects, not as artificial or arbitrary make-work, but as needed infrastructural projects, and expanding the completion of these projects to absorb idle labor. The stimulus to the economy provided by the employment and purchasing activity of the infrastructural projects, moves the economy as a whole. Thus we see particularly the insanity which is developing in Poland under the Sachs model, and threatening to be a characteristic of east Germany, under the pressure of the Anglo-American so-called "free market" model - Thatcherism. Unemployment in Poland and east Germany is actually criminal folly, in the sense that these people should not be unemployed; they may be moved out of industry, where, in the case of Poland or east Germany, there is a superfluous redundance in that big industry, but they should not be moved out into the streets. Rather, redundant workers should be moved out and absorbed appropriately in large-scale and other infrastructure projects, such as rail, water management, power, and even the construction of housing and so forth, so that no one should be unemployed, because that is an absolute waste and tends to glut the economy. There should be a very small fraction of unemployed attributable to mobility and special problems. There should be the opportunity to foster employment, by opening up the gates of employment in needed and economically justified work to absorb the idle labor. If there is not large-scale infrastructural development of the type we have indicated in Ea.tern Europe and the Soviet Union, as well as further infrastructural development in Western Europe, which is important, the situation in Eastern Europe and the Soviet Union is more or less a hopeless one. Perhaps the most crucial obstacle to infrastructural development is the. widespread and rather intensive belief, one may say blind belief, in the delusion that credit for large-scale infrastructural projects can be obtained only in the way in which the Bank of England, the present IMF and World Bank, and like-thinking institutions would prescribe. Fortunately, the belief is a delusion. Unfortunately, as we have indicated, the delusion is thus far widely accepted. In the history of the past 500 years of development of the economies of Western continental Europe and the Americas, there are two opposing models for the creation of public credit for financing of basic economic infrastructure and promotion of trade. One is the familiar one, which can be called, from the history of feudal times, the Lombard model: the model of central banking based upon the principle of usury. The opposing model is sometimes identified with the American System of political-economy, that is, the system associated with Treasury Secretary Alexander Hamilton, Mathew and Henry (father and son, respectively) Carey, and with similar figures in Europe. In the American experience in particular, this alternative to usury first appeared in the Massachusetts Bay colony in the middle of the seventeenth century. This colony, which was independent of the Parliament of Britain by virtue of a charter, and subject only to the monarchy, created its own domestic currency as a fiat currency drawn on the credit of the Commonwealth. Massachusetts Bay then used this credit by loaning it at very low prices, in the form of national banking, to foster circulation of goods produced in the Commonwealth, to foster what became a spectacularly successful growth in iron industries and other industries in the region. Thus, we have the two system of credit. One, associated with the American System, is that the state creates a currency and maintains a monopoly on that currency, forbidding the creation of currency by private banking interests, or the creation of currency in one's own country by a foreign agency. The true national banking mechanism, including private banks which work with the national banking institution, circulates this created credit, or currency, at low interest rates to selected categories of borrowers. The selection is based on consideration of prudence, ordinary banking prudence, and otherwise according to criteria of the type I have just indicated. These criteria are that scientific and technological progress should be fostered in a capital-intensive, energy-intensive way, such that rises in productivity and in absolute product, generated by use of credit at low interest rates, result in a greater production and rate of production of physical wealth, than is represented by the increase in debt and currency generated to foster this economic growth. On the other side we have what might be called the British system, the Lombard system. Under this system, the assumption is made that the world must start from the fixed hoard of combined gold and paper money, and what not, in largely private hands. State works, if they are to be fostered by means other than current tax revenue, must be fostered by the sale of public debt to private holders of such hoards of gold and paper money. The government must pay whatever borrowing costs private financial markets demand. As long as nations believe, under present international monetary conditions, that one must use what are called generally accepted current international banking practices, as the exclusive acceptable mode for financing investment into infrastructure, industry, and agriculture, Eastern Europe and the Soviet Union shall never, within the foreseeable future, achieve the necessary development of infrastructure, agriculture, and industry. And under those conditions, in the present physical conditions, the worst social and political, as well as economic, results must be expected. Thus, on this issue, there is very little room for comprise. Through national credit, we are assigning, implicitly, idle labor and idle resources to productive employment, in developing basic economic infrastructure, as well as improvements in agriculture, industry, and small high-technology enterprise. In general, we restrict the use of credit for other purposes, as much as is possible, in order to avoid the possibility that the debt caused by use of other credit might grow as rapidly as the increase of per capita output of physical wealth. Two considerations are primary, apart from the general emphasis on scientific and technological progress in a capital-intensive, energy-intensive mode. First of all, we must emphasize the matter of proportionality, that there is a ratio of employment in the respective categories and sub-categories of production, such as infrastructure and its sub-categories, agriculture, manufacturing, and so forth, which in effect represents a balance in the same way that the division of labor in a factory represents a balance or imbalance. A balancing of investments for the optimal effect is of course a priority, and also is the matter of the generation of flows of trade, the circulation through markets, in such a manner to stabilize the growth of the productive tax revenue base and the national credit system itself. This will require international credit, and the strength of international credit will be dependent in the medium to longer term on the success of the national credit system used in the respective countries. Special reports on LaRouche's 'Productive Triangle' program are published in every major European language, and Helga Zepp-LaRouche launches an aggressive speaking tour campaign throughout Europe, addressing conferences in numerous capitals including in many Warsaw Pact and other Soviet countries newly gaining their independence, including Hungary and Poland, while representatives of the Schiller Institute host seminars on LaRouche's program across eastern Europe, including in Czechoslovakia, Belarus, and Ukraine, as well as nearly every country in Western Europe. 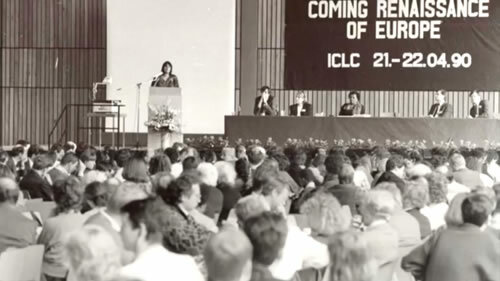 Helga LaRouche addresses an international conference titled 'The Coming Renaissance of Europe' held in Germany in April 1990. "Germany, the heart of Europe, must be the locomotive which raises the economic development of the whole of Europe to a qualitatively new level. The program of the 'Productive Triangle,' proposed by the U.S. economic scientist Lyndon LaRouche, is the crucial key to this. A high-speed rail system will not only connect the Paris-Berlin-Vienna triangle, but, simultaneously, will enclose a region with the greatest immediate growth potential, as far as industrial and labor capacities are concerned. 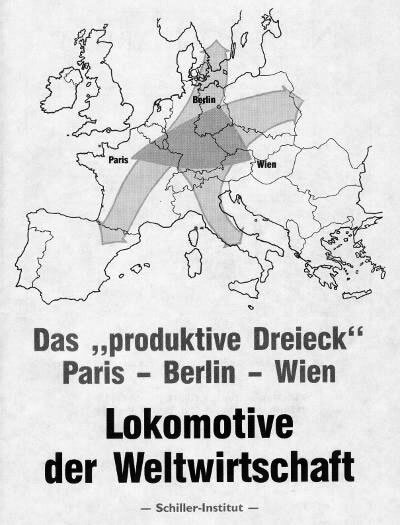 The rapid expansion of infrastructure and, especially of a productive Mittelstand in industry and agriculture can initiate a new economic miracle here, which, through new industrial corridors, will soon be able to reach the whole of Eastern Europe, the not-so-developed regions of Western Europe, and also the Soviet Union. The great expanse of Europe, with the "Productive Triangle" as its core, will make possible such a great increase in productivity and in the output of capital goods, that it will function as the locomotive for the world economy - not only for the infrastructure and industrial development of the East, but above all for the development of the Southern Hemisphere. Our answer to this question of whether we will finally develop the countries of the so-called Third World, will decide ultimately whether or not we meet the great moral challenge of the twentieth century... It has to become the identity of a sovereign Germany, that it is the place from which emanates the practical realization of a new, just world economic order." Maps of the 'Productive Triangle' concept, including radiating vectors of development into Eastern and Southern Europe. In March 1991, the Schiller Institute convenes a conference in Berlin on the 'Productive Triangle' program, attended by representatives from numerous newly independent eastern European nations, including Hungary, Czechoslovakia, Poland, Latvia, Lithuania, Russia, Armenia, Bulgaria, and Croatia. In a message to the conference, Lyndon LaRouche calls for "a sphere of cooperation for mutual benefit among sovereign states" to united Eurasia. The conference adopts a resolution, the 'Berlin Declaration,' which calls for the nations of Europe to seize the "unique historical opportunity" presented by the end of the disappearance of the Iron Curtain, and states: "We strive for a just, new economic order, which secures peace, in that all peoples are given the same opportunities for economic and social development. For, development is the name for peace." What is required is a 'grand design' of European policy, which not only masters the task of reconstruction but simultaneously contributes to world development and peace. Such a plan is Lyndon LaRouche's proposed "Productive Triangle" program, which foresees the construction of infrastructure European-wide, including the territory of the Soviet Union. It is a plan for peace in Europe through development. 1) Construction of a Europeanwide high-speed rail network 12,000 kilometers long for freight and passenger transportation, which links up conventional high-speed trains to the more advanced magnetic levitation technology, and reaches from the Atlantic to the Soviet Union. 2) Construction of European waterways, above all, completion of the Main-Danube canal. 3) Replacement of the technologically obsolete and environmentally dangerous nuclear plants in eastern Europe and the former G. D. R. with the construction of inherently secure, environmentally sound nuclear power plants, like the HTGR. 4) Increase in the percentage of those employed in research and development to at least 5% of all employed. Priority efforts in the fields of laser and particle beams, fusion and plasma processes, materials research (superconductors, etc. ), optical biophysics, AIDS research and manned space travel. 5) A corresponding educational reform, which combines the Humboldtian education ideal with the fostering of creative thinking in the realm of modern natural science. 6) Encouragement of a productive small and medium industrial force (Mittelstand) in industry and agriculture through tax incentives and generous tax deductions. 7) Two-tiered credit system: low-interest (2-5%), long-term credit for investment in construction, trade, and production; high-interest credit for non-productive purposes. 8) New credit creation in the form of bonds from European national banks in the order of several billion DM per year, which are earmarked exclusively for productive investment in capital intensive areas, and therefore not inflationary. A unique historic opportunity, like the one opened by the disappearance of the "iron curtain," demands unusual steps, as, for example, in the F.R.G., the change of Bundesbank laws regarding private credit monopoly. If Europe's governments actually put this program into effect, they will create the conditions for immense private investments. The numerous unemployed, in part highly skilled labor, can be productively employed once again. The living standard and technological level in eastern Europe would not only reach that of western Europe, but utterly new branches of production would come into being. So, too, on a private economic basis, would a new economic miracle occur. The realization of the "Productive Triangle" is not only the sole means to reconstruct the economy of eastern Europe and the new German states; it is also the only possibility of putting the peaceful transition from totalitarianism towards a free society in the Soviet Union on the right track, without causing civil war. At the same time, an economic miracle in Europe is the only thing which will pull the'world economy as a whole out of the depression and transform the decades-old promise of "development for all peoples" finally into reality. In place of the "new world order" proclaimed by the Anglo-Americans, which is supposed to emerge from the war, we strive for a just, new economic order, which secures peace, in that all peoples are given the same opportunities for economic and social development. For, development is the name for peace. The 'Productive Triangle' is expanded to encompass Eurasia as a whole with three development corridor routes spanning the continent through Russia & China. Following the official dissolution of the Soviet Union, Lyndon LaRouche expanded the concept of the 'Productive Triangle' to include the former Soviet territories in Russia and central Asia, stretching all the way to the Pacific coast of China. 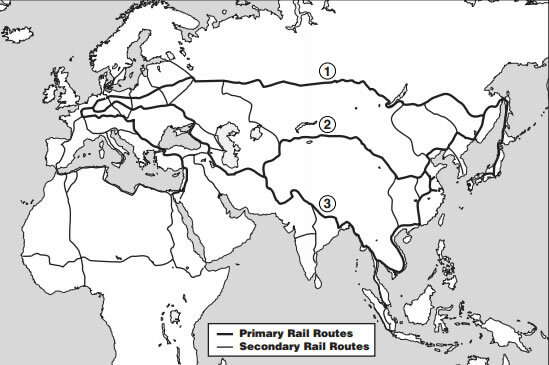 This proposal, which became known as the 'Eurasian Landbridge,' concentrated on three 'development corridors' spanning the Eurasian continent: a northern route via the Trans-Siberian Railroad to Vladivostok; a central route through Ukraine, Kazakhstan, and China; and southern route from Western Europe to China through Turkey and Iran. This plan would economically integrate the Eurasian continent, maximizing the productive potential of its territory and peoples for the common benefit of all, and resolving the artificially imposed strategic divisions among the great powers through the promotion of development in their mutual interest. 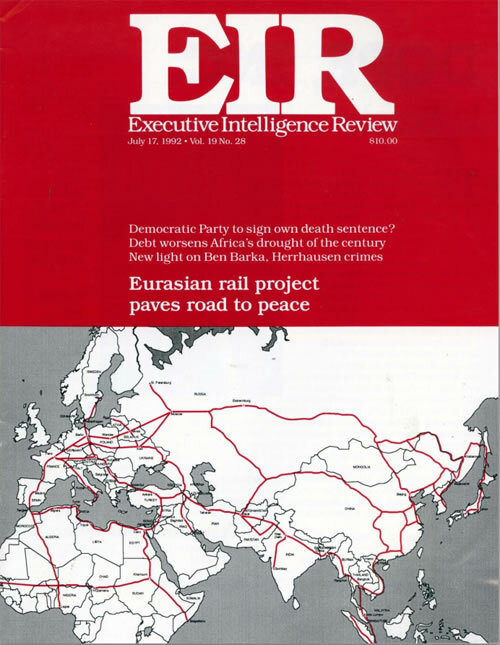 In 1992, EIR magazine publishes a report calling for an alliance for development among Eurasian nations as the foundation for a 'new economic and monetary order' for the planet following the collapse of the Soviet Union. Executive Intelligence Review publishes a feature-length study elaborating this "integrated Eurasian development network stretching from the Atlantic to the Pacific," stressing that it will serve as the centerpiece and foundation for creating "an alliance of nations committed to a common programmatic perspective for establishing a just world economic order." This new economic and monetary order would be comprised of a "community of interest among sovereign nations committed to rapid economic development" to replace the failed financial systems of both East and West, bridging the rich and diverse cultures of the Eurasian continent and ending to the legacy of the geopolitical "Great Game" policy of perpetual war. 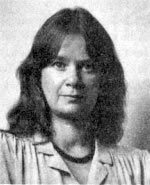 Helga Zepp-LaRouche states that the world is experiencing the opportunity for "the beginning of a new more hopeful time and the emergence of a new, just world economic order" and issues a call for a peaceful revolution to establish an "International Coalition for Peace and Development" [PDF]. 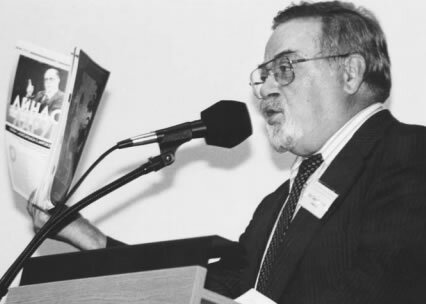 Dr. Taras Muranivksy co-chaired the first-ever Schiller Institute conference in Moscow titled 'Alternative Approaches to Economic Reform' in October 1992. The Schiller Institute sponsors its first-ever conference in Russia, on October 30-31 in Moscow to announce the release of a Russian-language edition of LaRouche's textbook on physical economy, So You Wish To Learn All About Economics? [PDF]. With Russia undergoing the disastrous effects of the IMF "shock therapy" policy, the conference is titled "Alternative Approaches to Economic Reform," focusing on LaRouche's proposals for a rapid reconstruction of the Russian economy by means of the Productive Triangle/Eurasian Landbridge program. The conference, held at the Russian State Humanitarian University, is attended by over 50 individuals representing leading political and academic institutions within Russia, and is co-chaired by Dr. Professor Taras Muranivsky, rector of the Ukrainian University in Moscow. Muranivsky delivers a speech about "establishing a new economic theory" based on LaRouche's ideas on the science of physical economy. 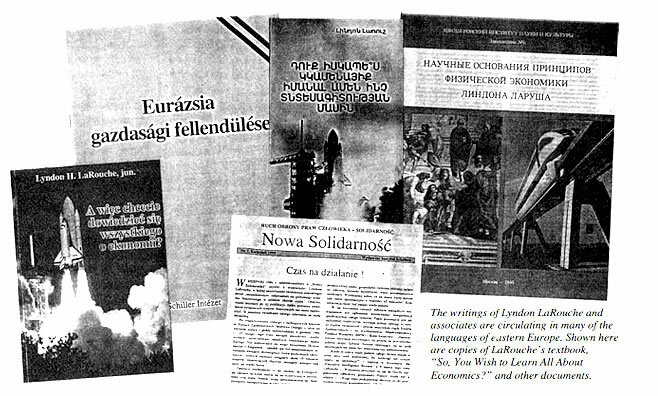 Various writings by LaRouche on physical economy published in several eastern European languages including Russian. In the foreword for the Russian-language publication of his economics text, Lyndon LaRouche writes: 'The Russian edition of this textbook appears at the moment the greatest financial bubble in history is collapsing upon us. If we fail to take appropriate corrective action soon, this collapse could become the worst economic disaster in European history. Out of the wreckage of that monetary collapse, a new form of national economy must be constructed." 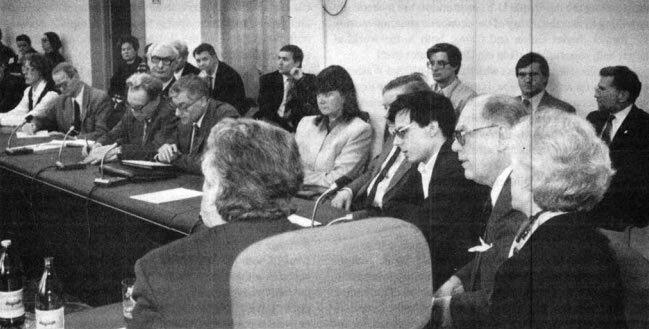 Lyndon LaRouche travels to Moscow for a series of lectures on economics during his first trip to Russia in 1994. 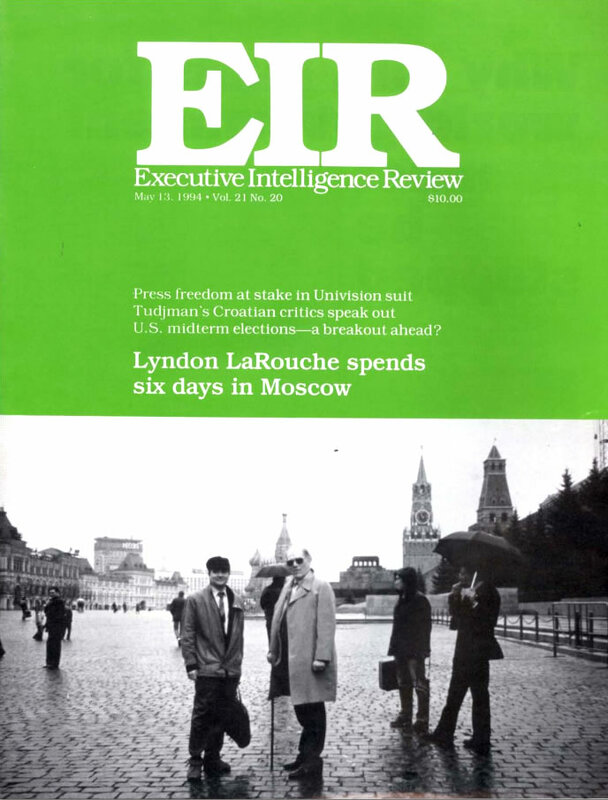 Here LaRouche is pictured in front of the Kremlin. In April 1994, Lyndon LaRouche travels to Russia for a week of meetings and speaking engagements in Moscow, together with his wife Helga. LaRouche's first public event is a lecture sponsored by the Ministry of Economics of the Russian Federation on April 25, where LaRouche states: "The problems in Russia are a reflection not of conditions internal to Russia, but the reflection of a collapse in the world economy... What is going to happen, without question, is a general total breakdown collapse of the global financial system... If there is an agreement on principles of sound economy, then there can be an agreement among states to reestablish, in a very short period of time, a new world financial and monetary system to replace the old one, while we put the old one into bankruptcy." 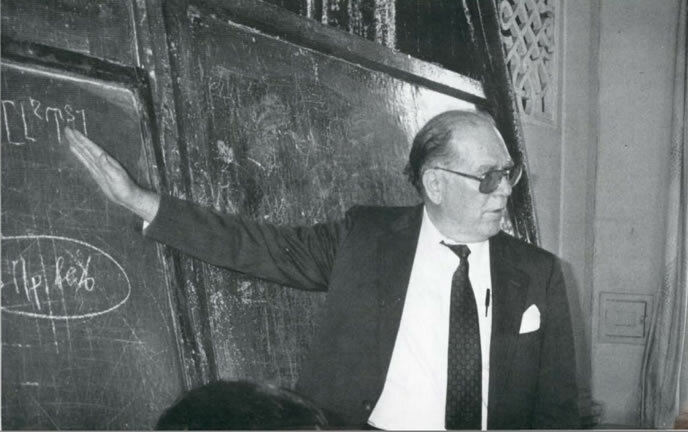 Lyndon LaRouche lectures on his science of physical economy at a seminar of Russian scientists in Moscow. LaRouche also addressed seminars at three institutes of the Russian Academy of Sciences: the Institute on Scientific Information on Social Science (INION), the Institute of Oriental Studies, and the Africa Institute. 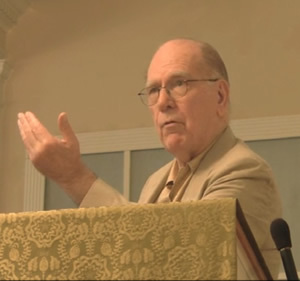 At the INION, LaRouche stressed that the Russian intelligentsia must understand the collapse of the Soviet system was merely one part of a global process of collapse, caused by a general failure to abide by the fundamental laws of physical economics, which would doom the free-market system of the West as well: "You get a reflection of a failure to comprehend this problem, and a belief that the disease which is called free trade, is the superior alternative to communism. So instead of bowing to the statue of Karl Marx, you are now supposed to bow to the statues of Adam Smith and Ricardo. This tends to create an instinctive lack of appreciation for the fact that the entire global system is now about to collapse." Lyndon LaRouche joined by Dr. Suslov and Dr. Kuznetsov, in dialogue on his principles of physical economy at the Economics Academy in Moscow. Additionally, LaRouche was hosted by Dr. Pobisk Kuznetsov at a gathering of the "Prezident" group of approximately 60 academicians and other scientists [PDF]. Following LaRouche's visit, Kuznetsov published a report in the Russian journal Rossiya 2010 [PDF]in which he called for a new unit of measurement to be applied to physical economics, which he proposed be called 'the larouche,' or "La" for short: "Let us introduce the physical magnitude of 'a larouche,' designated by La, which gives the number of persons who can be fed from 1 square kilometer, or 100 hectares, during one year. Our base magnitude of area is 1 square kilometer or 100 hectares. This base value of area is necessary, in order to bring all existing world food statistics to a single basis. The figures cited above... correspond to 'potential relative population density,' introduced by LaRouche. We have introduced the new unit of measurement, the larouche, which is the quantity of persons able to be fed from a certain magnitude of area, taken as the unit value in this system... We share LaRouche's view that the magnitude of potential relative population density can serve as an indicator of 'intellectual culture,' but taking into account the quite diverse values for farv (photochemically active radiation per vegetative period), we shall compare not simply 100 hectares, but 100 hectares for a given local farv value." LaRouche in dialogue with Russian economists at the Economics Academy of the Russian Ministry of Economics in Moscow. Upon his return to Washington DC, LaRouche delivered a report on his trip to a meeting of diplomats and press [VIDEO], where he repeated what he had stated at the Ministry of Economics in Moscow, saying: "Have no doubt that the present global financial and monetary system is not only going to collapse, but is going to go into an absolute breakdown collapse, unless various governments, including the U.S. government, were to put the present monetary system into bankruptcy. That would stop the collapse, and nothing else will stop it. Therefore intelligent governments will consider nothing serious, except to make preparations for this collapse and to organize quickly a recovery of a new financial system and a new monetary order the instant the collapse occurs."